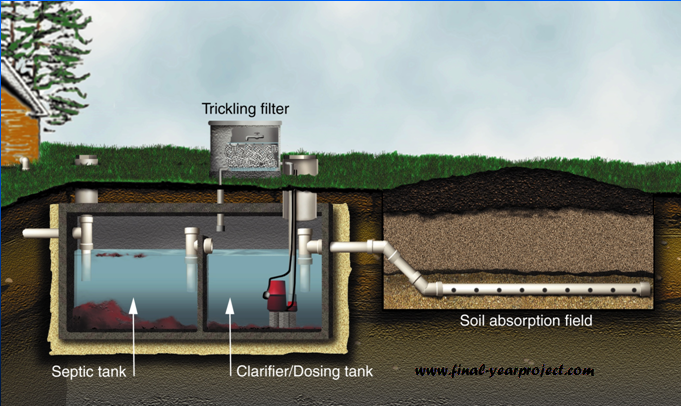 This is Civil project report on Trickling filter system. This filter is sometimes also known as bio-filter, biological filter, biological trickling filter etc. and consist of a bed of highly permeable media on whose surface a mixed population of microorganisms is developed as a slime layer and is non-submerged fixed-film biological reactor. The limitations of the trickling filter included a relatively high incidence of clogging, the long rest period required, head loss, and the relatively low loading that could be used. It is actually not like a typical filter and does not do any filtering. You can also Subscribe to FINAL YEAR PROJECT'S by Email for more such projects and seminar. Rock filter designs have been classified as low- or standard-rate, intermediate-rate, and high-rate. Plastic packing is used typically for high-rate designs. Much higher organic loadings have been used for rock or plastic packing designs in "roughing" applications where only partial BOD removal occurs. Trickling filters are classified on the basis of loading viz. hydraulic or organic loading, as high-rate or low-rate. Low-rate filters normally produce a consistent effluent quality even with varying influent strength and are relatively simple. High-rate filters are usually characterized by higher hydraulic and organic loadings than low-rate filters. This project material consist of project report and presentation on trickling filter system and use this only for your reference and study purpose.